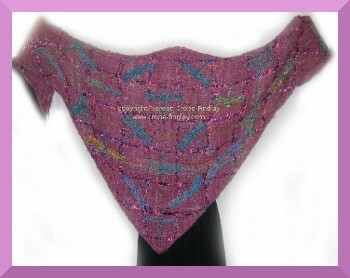 I am simply breathless looking at your gorgeous shawl! Whoo! And here I sit in Dragonfly Cottage with a huge dragonfly tattoo on my right writing hand. I’ma just a thinkin’, well, you know!!! You are a world wonder! 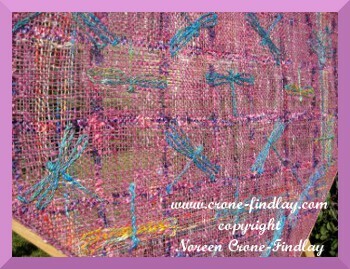 Oh, and I just watched your video on sewing the spool knitted cord onto the woven square and whooeee, I LOVE that. 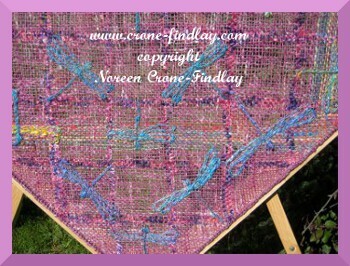 You’ve given me a drop-kick back into my fiber art! Wheeeee… Thanks so much Noreen. The shawl is just the most beautiful thing I’ve ever seen! Oh my goodness that shawl is the most beautiful thing I have ever seen. I love dragonflys have some hanging in my bedroom. I would just hang the shawl up and look at it. Also awsome braclet in vidio. 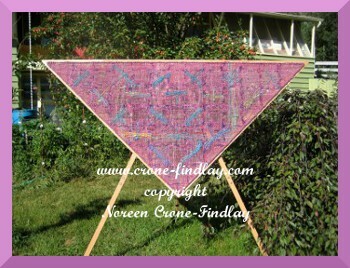 Actually, I do have the shawl hanging up in my studio when I don’t wear it. It’s too beautiful to leave it in a drawer! I just love those dragonflies, and it gives me a little burst of ‘happy’ when I glance up at it. Utterly beautiful, gorgeous, lovely! Who’d have thunk an increase in the mosquito population would have the wonderful consequence of more dragonflies? I’m sitting here trying to come up with appropriate words – all the ones I think of are inadequate to capture what I feel looking at this piece. Sublime. Something for a nature spirit to wear. Magical. almost… almost….those will have to do. Thank you so much, Aleksa! The dragonflies were truly the whirling, flashing silver lining of the dreadful clouds of the mosquitoes! So much beauty!!!! Thank you thank you thank you for these gorgeous words, Zann! You have truly made my day!!!! 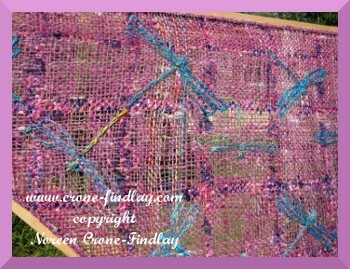 My loom just got made. So I am looking at all the things that can be done on it and I am amazed. 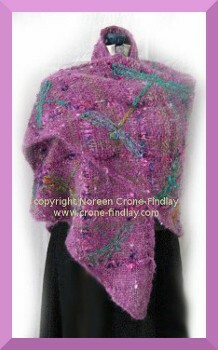 I may never get to go back to sewing, knitting or spinning! I want to try embroidery on a shawl after I get the hang of it. Thanks for the inspiration.